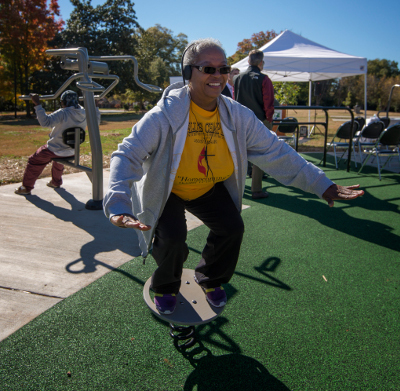 By promoting physical activity, healthy food options and a clean environment, Mecklenburg County can build a culture of health and wellness. "It’s not a coincidence that health and happiness often go hand-in-hand. We want to build a happy community here in Mecklenburg County, so let’s keep ourselves and our environment healthy." Establish a resident toolkit for easy navigation of preventative physical health services and behavioral/mental health services, and create community ambassadors for the toolkit. Address language barriers in the provision of health services. Reevaluate residents’ access to healthy food through an updated community food assessment. Increase businesses providing wellness programs for their employees. Develop preventative programs and community events designed to promote improved health and wellness decision-making. Assure free and low-cost health clinics are open and accessible throughout the community. Review local government regulations to mitigate barriers to healthy food initiatives and establish policies and programs in support of the local food system, including farmers markets and entrepreneurial small grocers. Facilitate the expansion of mobile farmers markets with healthy food products in low food-access areas and on under-utilized land. Support a K-12 healthy choices campaign. Conduct a comprehensive review of local government environmental protection regulations and identify opportunities to improve navigation for the development community. Establish a public-private environmental education and coordination roundtable to enhance collaboration across entities. Encourage local governments to become Certified Community Wildlife Habitats and continue certifying Master Naturalists. Implement the Catawba Basin Water Supply Master Plan recommendations. Preserve and expand the tree canopy through street programs, ordinances, and community engagement. Partner to integrate environmental considerations into the 2045 Metropolitan Transportation Plan. Monitor the health of nature preserves and heritage sites. Create a mechanism for distribution and exchange of information across jurisdictions regarding location of parks and greenway/paved trails proximate to neighborhoods. Purchase additional land for open space, greenway/paved trails and parks purposes. Promote stream corridors in communities as greenways/paved trails that connect residents with the natural environment and opportunities for recreation and active transportation. Health insurance coverage allows individuals of all ages to receive preventive care treatment, meaning individuals are more likely to detect health problems early, when they’re less expensive and less difficult to treat, and more likely to stay healthy. In 2010, the Affordable Care Act was passed in the United States in an effort to decrease the number of uninsured citizens. In 2015, the percent of uninsured Americans dropped from 14% to 9%. Mecklenburg County’s numbers are slightly higher but follow the same downward trend: from 16% in 2014 to 12% in 2015. Several campaigns throughout the country encourage people of all ages to become more physically active. Whether at work, school, home, or while commuting, Americans spend a lot of time sedentary. 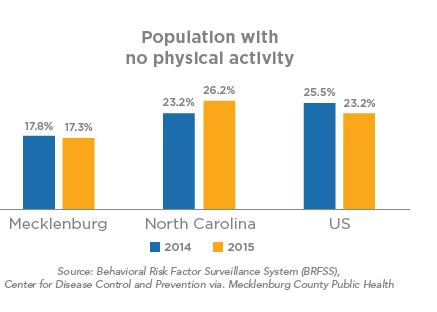 When it comes to the percentage of individuals not engaging in physical activity, Mecklenburg County is performing better than the country as a whole, however the results are low with only 18% of residents in 2014 and 17% in 2015 being active.